Additional preservation statuses can be created depending upon need and preference. 1. From the Admin tab, click on the Statuses sub tab at left. A series of tabs will appear at the top of the screen to the right, as shown below. Click the Preservation tab. 3. Select the desired weight of the item from the Weight drop-down box. The status weight controls the sorting order of each status in menus where they can be selected. The lower the number, the higher the item will appear on the list. Before you set a weight, review the current statuses beneath the Preservation Status List bar. These are the current preservation statuses and are listed in order by weight. 4. 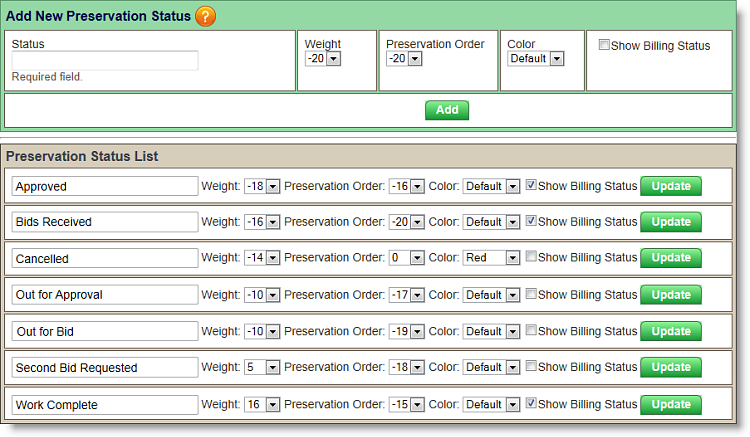 If you would like to control the order in which preservations appear in Properties>Preservations (for example, you can elect to show items in Bids Received status higher on the preservation list than items in Work Complete status), assign a Preservation Order number using the same sorting order rules listed in step #3 (lower numbers appear higher on the list). 6. You have the option to check Show Billing Status for each Preservation Status. This will enable you to see the status of the vendor invoice for those properties. This information is found on the Properties > Preservation tab. 7. Click the green Add button. The new status will be added to the current status list. To track ongoing approved services (reoccurring yard service, cleans, and pool service), set a preservation status called ONGOING SERVICES APPROVED. This will allow a report to be generated to track the preservation records, and will notify the billing department that the invoices received are approved.